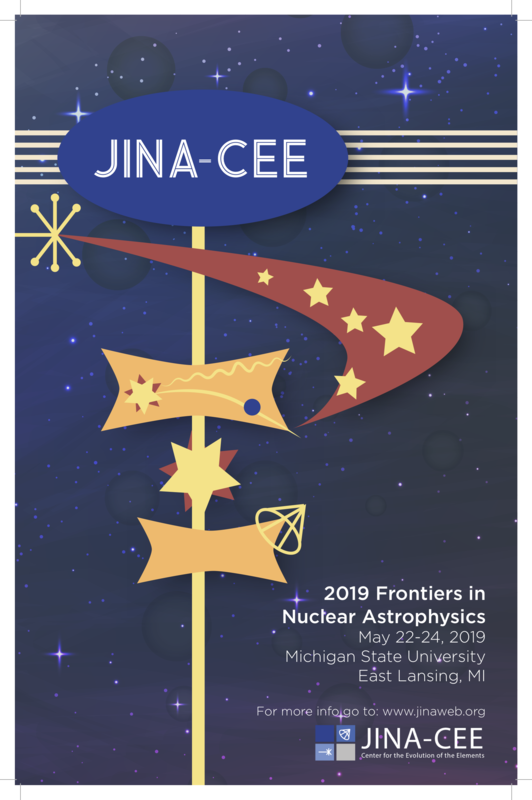 The JINA-CEE Frontiers in Nuclear Astrophysics Meeting will be held on May 22-24, 2019 at the National Superconducting Cyclotron Laboratory (NSCL), 640 S Shaw Ln, East Lansing, MI 48824, USA. The meeting will be preceded by a workshop for junior researchers which will also take place at the NSCL on May 20 and 21. This is the ninth in a series of former JINA and now JINA-CEE meetings that brings together JINA-CEE participants, collaborators, and other interested researchers in nuclear physics, astronomy, and astrophysics to discuss progress and future directions related to the understanding of the origin of the elements and neutron stars. One main goal of the meeting is to encourage students and post-docs to share results of their research with the community. All participants are strongly encouraged to contribute either a 15-minute oral presentation or a poster. The meeting will be comprised of oral presentations, a poster session, and a participant-organized breakout session. Information on the 2018 JINA-CEE Frontiers in Nuclear Astrophysics Meeting held in South Bend can be found here. This meeting is hosted by the Joint Institute for Nuclear Astrophysics -- Center for the Evolution of the Elements, a NSF Physics Frontier Center.